Passersby are reflected in an electronic stock quotation board outside a brokerage in Tokyo, Japan, October 23, 2017. SYDNEY - Asian shares held within striking distance of recent decade highs on Tuesday even as Wall Street fell from record levels, while currencies kept to narrow ranges ahead of key economic events. Investors are closely watching China and the 19th Communist Party Congress, which winds up on Tuesday and at which President Xi Jinping is expected to release the composition of the Standing Committee - the apex of power in the country. MSCI’s broadest index of Asia-Pacific shares outside Japan .MIAPJ0000PUS was 0.1 percent firmer at 549.71 points, not far from a 10-year high of 554.63 set last week. Australian shares also edged higher and back toward a 5-1/2 month peak touched on Monday, while Japan's Nikkei fell 0.2 percent from a 21-year high. “Despite a lack of any real movement in markets, we know there are landmines and event risk to work through and this creates opportunity for short-term traders,” said Chris Weston, chief strategist at IG Markets. In the United States, the Dow Jones Industrial Average fell 0.23 percent, the S&P 500 lost 0.40 percent and the Nasdaq Composite slipped 0.64 percent. Corporate results will dominate near-term sentiment with earnings from General Motor, McDonald’s, and Lockheed Martin due later in the day. European STOXX 600 shares rose 0.16 percent, although Madrid's bourse IBEX shed 0.6 percent as Spain's crisis entered another week. Madrid took the unprecedented step of firing the government of Catalonia on Saturday in a last resort to thwart its push for independence. Catalan leaders called for civil disobedience in response. In Germany, the far-right Alternative (AfD) party is set to clash with other parties over its nomination for a senior parliamentary post when the Bundestag meets on Tuesday. The political tensions have weighed on the euro which hovered near two-week lows at $1.1752. The market is on edge ahead of a European Central Bank meeting on Thursday where it is expected to announce some form of policy tapering. Investors were also biting their nails as suspense builds over who might be the next chair of Federal Reserve after Janet Yellen’s term expires in February. The market is betting on Federal Reserve Governor Jerome Powell as the likely choice while Trump is also weighing on Stanford University economist John Taylor and current Federal Reserve Chair Janet Yellen. The dollar index .DXY inched lower to 93.8 but stayed in sight of a recent two-month peak. The New Zealand dollar rose 0.2 percent from near five-month lows with investors focused on any policy tidbits out of the country's new Labour government. In commodities, spot gold XAU= was mostly unchanged at $1282.26 an ounce. Oil prices were little changed as supply disruptions in Iraq dented exports by OPEC’s second-largest producer and U.S. drilling rates showed a slowdown. Brent crude LCOc1 added 6 cents to $57.43, while U.S. crude CLc1 rose 3 cents to $51.93 a barrel. 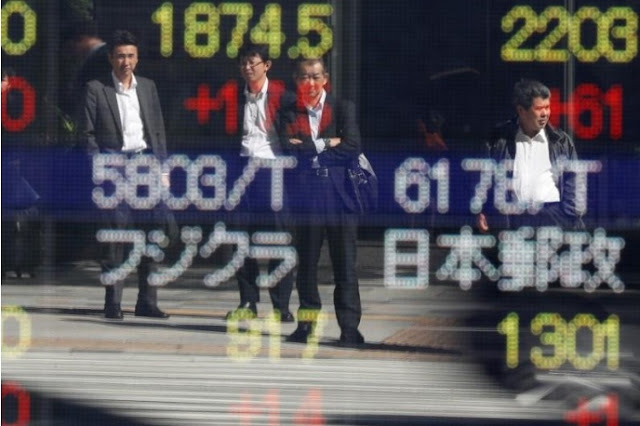 Asian shares held within striking distance of recent decade highs on Tuesday even as Wall Street fell from record levels, while currencies kept to narrow ranges ahead of key economic events. Investors are closely watching China and the 19th Communist Party Congress, which winds up on Tuesday and at which President Xi Jinping is expected to release the composition of the Standing Committee - the apex of power in the country.